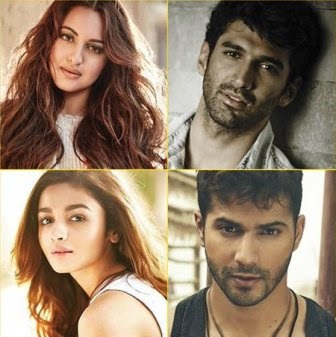 #AliaBhatt, #VarunDhawan and #SonakshiSinha are excited about upcoming mega movie #Kalank, which also stars Sanjay Dutt and Madhuri Dixit in Abhishek Varman directorial. Karan Johar has managed to pull off a casting coup of sorts by getting Madhuri Dixit, Sanjay Dutt, Varun Dhawan, Alia Bhatt, Sonakshi Sinha and Aditya Roy Kapur in the lead. The movie is titled Kalank, directed by Abhishek Varman. This film also marks the collaboration of Fox Star Studios, Dharma Productions and Nadiadwala Grandson Entertainment - the 3 best producers of this time. The film will go on floors by the end of April.